When you have a wonderful view, it makes sense to be able to enjoy it from every room. The 500sq ft kitchen in this great room is designed so it doesn't block the view from the dining room. 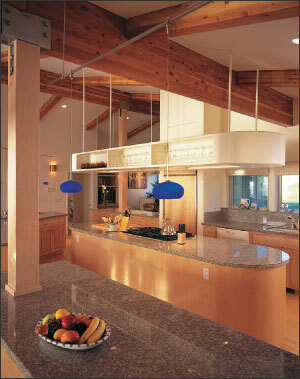 Curved sculptural elements are a feature of both the kitchen and the great room. This curved countertop serves as a casual eating area. Track lighting follows the shape of the curve. Suspended shelving units mirror the shape of the counter-tops. 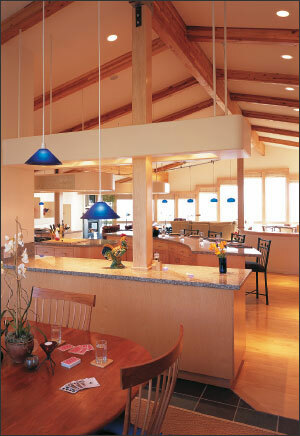 They also help to enclose the kitchen within the large space of the great room. The maple cabinetry features handcrafted detailing that matches trim on the windows. Maple panels on the fronts of the islands were carefully matched so the grain lines up. Contrasting the maple flooring and cabinetry with white shelving was a way to add visual interest, says architect David Kingwill. The two materials play off each other, creating a strong visual dynamic, he says. The sink is positioned on a countertop beneath a window that overlooks a golf course. 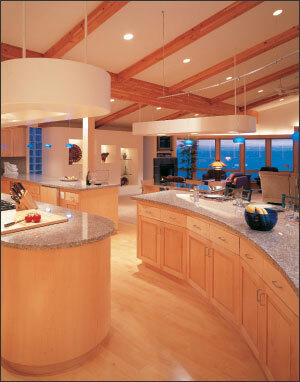 The cooktop, however, faces into the great room so the cook can socialize with guests. 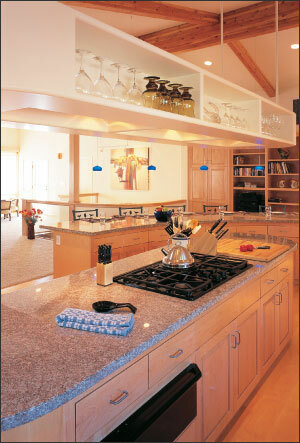 Curved, suspended shelving that mirrors the countertops below helps to define the kitchen in this large great room. Awe-inspiring ocean views determine the architecture of many homes. 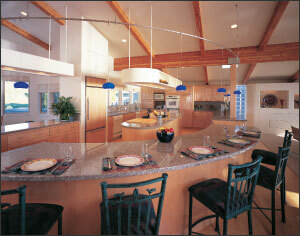 They can also help to shape the design of kitchens, as this beach house illustrates. Owners Vern and Joyce Vereschagin commissioned architect David Kingwill to design their new vacation home on a hill high above the Pacific Ocean. As the couple love to entertain, they liked the concept of a great room where guests could mingle and enjoy the view from all areas, including the kitchen. "We loved the idea of a room without walls," says Joyce Vereschagin. "It not only maximizes the view, but also creates a casual and relaxing environment. We particularly wanted an uncomplicated interior design, one that wouldn't detract from the view." As the great room measures 35ft by 60ft, there was plenty of space for the kitchen. However, such a large area could have created problems, says Kingwill. "The kitchen needed to be defined within this huge area. Yet, at the same time, we had to avoid any structures that would interfere with the view," he says. "Keeping a sense of openness was crucial." The solution was found by designing a series of curved countertops that define the space and encourage circulation between the various areas. The curved shapes also add a sculptural element, which is repeated throughout the room. "The curves, which were requested by the owners, help to soften the overall look and provide continuity between areas," says Kingwill. As well as curved countertops, there is a curved, sculptural wall in the great room which features niches to display glassware and ornaments. Kingwill also designed three suspended shelving units that play on the curved theme. "These units were designed to highlight specific items and to create a sculptural unity throughout the great room," he says. "Each one mirrors the shape of the counter beneath." The shelving units are suspended by steel rods and are kept above head height, so they won't block the view. Each one features indirect halogen lighting on a dimmer switch, designed to add a soft glow to the room at night. Maple cabinetry provides extensive storage, which was necessary to avoid cluttering up the countertops, says Joyce Vereschagin. "We wanted very smooth, flat surfaces. The granite countertops were specified to enhance this look, and because we wanted a low-maintenance kitchen," she says. The maple cabinetry matches the flooring and was chosen to enhance the soft, natural look. A centrally positioned refrigerator is integrated into the cabinetry. Other large appliances and the pantry line a side wall. Keeping these out of the way ensures they don't interfere with lines of vision, says Kingwill. The cooktop, however, is on an island. "This allows the cook to socialize with guests, who always seem to gather by the kitchen to watch and participate," he says.